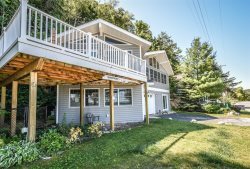 This wonderful home on Cedar Hedge Lake in Interlochen is just a short drive from Traverse City, the Interlochen Center for the Arts, and 2012's Most Beautiful Place in America the Sleeping Bear Dunes!! A short walk (2 blocks) to the Lost Lake Pathway hiking and biking trail. Enjoy a day shopping in Traverse City or bring your bike and hit the bike trails that are just a couple blocks away. Want to spend the day in? Just hang out in the rec room and play some pool or foosball! There are also two kayaks and a rowboat for your use. Cedar Hedge Lake is an excellent lake for a relaxing day on the water or off. The deck is the perfect place to enjoy a good book and view of the lake, and any other boaters on the lake are there for the same tranquility and are never bothersome. You never know what amazing wildlife you might see, the bald eagle is making a steady recovery, and whitetail deer and loons are a common occurrence! Stay for the National Coho Salmon Festival, the last weekend in August! Johnson's Landing has two bedrooms, a loft, and two bathrooms with an occupancy of six. The kitchen was remodeled the spring of 2013, adding a dishwasher, and increasing counter space with a microwave above the stove. Very comfortable, beautiful setting, had everything we needed. We did have a baby squirrel get in the house. We are not sure how. We did get it out ourselves. It just added a little excitement to our trip and gave us something to laugh about! We have been renting houses in the area for a couple of years and by far this was the best house for our needs. Danielle was great to work with. The place was great for our family girls weekend. The gas fireplace came in handy when the weather cooled down.